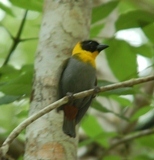 The Katanga Masked Weaver Ploceus katangae breeding male is yellow with a black mask. It is distinguished from the Southern Masked Weaver by having more saffron around the mask, less black on forehead, darker green back. It has much less saffron around the mask than in the Tanganyika Masked Weaver and the Lufira Masked Weaver. The yellow green rump is conspicuous in flight. Female and young birds are dull coloured. 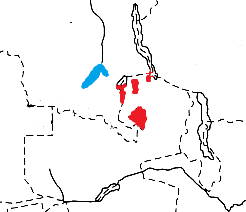 P. k. katangae in Zambia and in DRCongo along the Luapula River (see red on map). P. k. upembae, in SE DRCongo (Lualaba River) (see blue on map). This race has a longer bill than the nominate, the male has a greenish nape, and the female has more olive on the mantle. This race is sometimes considered to be a separate species, as indicated by preliminary molecular data. The Katanga Masked Weaver has a very localized distribution and population size is unknown. The Katanga Masked Weaver inhabits swampy areas, especially when breeding. When not breeding, it may move locally to join mixed bird parties in miombo woodland up to 7 km from water, while others remain in the swamps. 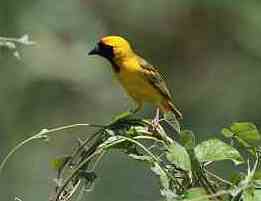 The diet of the Katanga Masked Weaver is unknown but it probably feeds on seeds and insects. The Katanga Masked Weaver is probably polygynous, and it breeds in small colonies although solitary nests with 1 male per site also occur. The nest is kidney-shaped with the entrance below and no tunnel, being similar to that of Southern Masked Weaver. Nests are placed in reed and papyrus beds in swamps, or in bushes or trees near lakes. The eggs (1-2) are pale greenish or greenish blue, spotted with bright brown and light chestnut spots. There is 1 PHOWN record for the Katanga Masked Weaver (see PHOWN summary), but many more are needed. Submit any weaver nest records to PHOWN (PHOtos of Weaver Nests) via the Virtual Museum upload site.